A lost golf ball is a detriment to a golfer's score, given the stroke and distance penalty consequences. Losing a golf ball while attempting to advance the ball through the playing area includes a one stroke penalty and a distance penalty. According to the United States Golf Association and the official Rules of Golf, a player may play a new ball as near as possible from the spot where the original ball was played under penalty of one stroke. However, there are specifics to the designation of a lost ball and some exceptions to the rule. 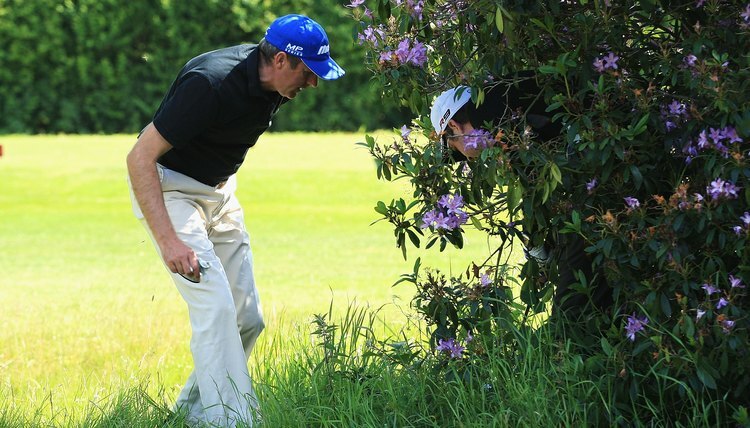 A golf ball is deemed "lost" after a player declares it lost. This can occur immediately after a played golf shot if a player is virtually certain the ball can not be found, or it can occur automatically after allowing the player and/or the player's caddie to search for the ball for no longer than 5 minutes. Once that time period is complete, the ball is considered officially "lost." Although a ball hit of of bounds (hit outside the boundaries of the golf course) is not always considered a lost ball, the USGA rules state that the penalty and procedures related to a ball out of bound are the same as if the ball were "lost." According to the Rules of Golf, a player who hits a ball of bounds must consider the ball out of play and must, under penalty of one stroke, hit the next shot from as near the spot where the original ball was played. If a player believes he has hit a ball into an area of the golf course where he there is a likelihood of losing a ball, or if he has hit it out of bounds, he may hit what is called a provisional ball. In order to save time, the player, after informing other players, may play another ball from the same spot as the original. If the first ball is not found and is deemed lost, the provisional ball will be declared "in play" and the player must proceed using that ball and must incur a one-stroke penalty. A ball that enters a water hazard is not considered a lost ball, even if the ball is in water that would not permit the player to search for it. According to the USGA, a player must instead proceed with the rules that govern water hazards. The player may, under penalty of one stoke, play a new ball from the spot where the original was played, or drop a ball behind the hazard, keeping it between the hole and the spot where the original ball entered the water. If the ball is in a lateral hazard, (water running parallel to the direction of play), the player may drop a ball within two club lengths from the spot where the ball entered the hazard and no nearer the hole. Each option includes a one-stroke penalty. If a player believes with virtual certainty that a ball that has not been found is in an obstruction, the player may proceed under the rules governing obstructions. Some times, depending on the kind of obstruction, there is no penalty to the golfer. This also applies to abnormal ground conditions or issues of inference. Also, if a ball cannot be found because it has been removed by an outside agency-- an animal, bird or even a spectator-- the player may not be penalized.